Easy Digital Downloads comes with PayPal Standard built-in. Your Payment Gateways tab will look like this with no extra gateways installed. When checking out with PayPal Express, the user experience is very similar to PayPal standard, except it is more secure. Note: if using PayPal Pro to process credit cards, you must have an SSL certificate. In-Context Checkout works only with PayPal Express. To use In-Context Checkout you must complete two settings. On the Downloads → Settings → Payment Gateways page you'll find both of them. A merchant ID is required for In-Context Checkout. You can look up your merchant ID by logging into https://www.paypal.com. 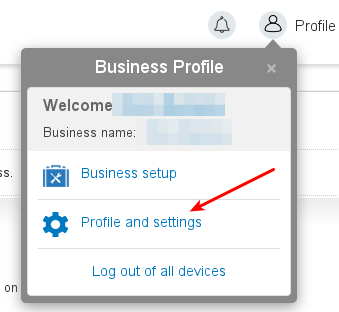 Click the profile icon on the top right side of the page and then select Profile and settings in the Business Profile menu. (If you do not see the profile icon at the top of the page, click Profile, which appears in the top menu when the My Account tab is selected.) Click My business info on the left, and the Merchant account ID is displayed in the list of profile items on the right. You may read more about In-Context Checkout at PayPal.com. This will open a popup window. Click on the API Credentials tab. You'll see two API keys for Live and two for Test. Copy those credentials to Downloads → Settings → Payment Gateways in your Easy Digital Downloads admin panel. See this guide for a more information about obtaining API keys. If you'd like a testing account on PayPal you can follow the instructions in our PayPal Sandbox document. PayPal's Instant Payment Notifications (IPN) are how PayPal communicates with your site to do things like confirm completed sales, failed sales, etc. For recurring billing to work properly with PayPal Website Payments Pro and Express, it's very important that your IPN settings are working properly. Configuring your PayPal IPN is simple. 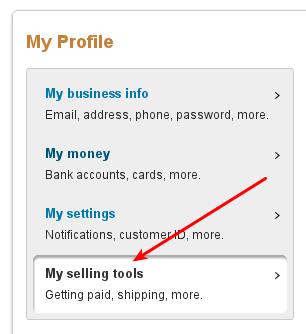 First, log into your PayPal account and go to Profile → My Selling Tools → Instant Payment Notifications. After you click Update you'll be presented with a page of information and a link to Choose IPN Settings. Note: please replace "yoursite.com" with the appropriate name of your website. Important! Subscription tracking will not work if IPN is not enabled and set to the proper URL. Supported Countries: PayPal Express and Website Payments Pro are not available in all countries. Please use the following links to determine if your country is supported. If you receive an error saying "Merchant country not supported", that means your country is not supported. Is this extension PCI compliant? What is the difference between Paypal Express and Paypal Standard? Paypal Standard (which is included with Easy Digital Downloads for free), sends the user to Paypal to complete their purchase. Whereas with Paypal Express, while the user is sent to Paypal to agree to the purchase, it is not actually completed until they are back on your site. This is less prone to have communication issues with Paypal and results in payments being more reliably set to "Complete" in your Easy Digital Downloads store. Paypal Standard often has issues with setting payments to "Complete" because it uses the PayPal "IPN" service (Instant Payment Notification), which can fail for various reasons and is difficult to track down the root cause of. If this error appears on checkout, it's likely due API credential. Verify your API credentials are correct.